Matthias Pfeiffer from Green Card Support Service surprises together with Schweiz Aktuell some Greencard winner. GCAS publishes here a small selection of their winners, who gave us permission. If you as one of our winners, would like to be removed from this list, please send us an email. We fully respect the privacy of our clients. Sorry, it took such a long time…. I now live in Leesport, PA, just bordering Bernville. Thank you so much for your support! If you have any questions or I can help somehow, please let me know. finally after 6 months best regards from Florida. I am sending you a picture of Peter’s dream (his own knife and tool shop) and a news- paper article. We are happy and healthy, appreciating the lower fall temperatures now. received your letter last week that I won. UNBELIEVABLE!! Attached I am sending you the photo for your website. Franziska Gsell After a few problems in the beginning, we finally succeeded in getting our greencards due to the knowledge and support of Mr. Pfeiffer from Greencard Application Service. So many years after winning the greencard Mr. Pfeiffer from GCAS is still giving advice to me and my family. 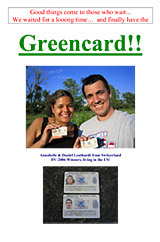 I received your message today that I won the greencard. I can still not believe that I am amongst the winners. Still have to sleep it over hoping that it had not just been a dream. I am so happy about this and hope that we can soon meet to discuss the further steps. T. Vögeli, CMP When applying for the 10th time I already said to myself, that this time would be the last one. But I applied two more times and as it looks now, it was worth continuing. When I saw the envelope from GCSS in the mail, I thought, oh my God, again not selected. But then I detected the A-Mail-Sticker and I began to realise that this could not be the usual Non-Winner notification. I was so excited when I opened the envelope and when I read „Congratulations“ I could not believe my own eyes. I had to read the letter several times and the more often I read it, the more joy I felt. Thank you very much, Mr Pfeiffer, for the many years of support until today. with Tele Züri some Greencard winner. Together with TeleZüri we surprise more greencard winner and make a short interview with our former green- card winner Monika Metzler, who now has her own angels-shop in the USA.